Home » Education » What is Environmental Change? Environmental change is a disruption of the balance of the environment due to natural factors and human factors, natural factors could be due to volcanoes, floods, etc., as for the factors that caused the contamination could be because human beings the environment. Environmental changes affect various aspects of life. The changes that occur in the human environment cause disruption of balance because some of the components of the environment into a reduced functionality. Environmental changes can occur due to human intervention and may also due to natural causes. The impact of the change is not necessarily the same, and yet eventually humans also must bear and overcome it. Changes to the environment due to human intervention e.g. deforestation, the construction of settlements, and the application of agricultural intensification. Deforestation which reduces the wild forest function as retaining water. As a result, power support forests into decline. In addition, deforestation can cause flood and erosion. Another result is the emergence of Tiger, boar, and snakes in the midst of human settlements because the narrowness of the habitat of these animals. The construction of settlements in the fertile areas is one of the demands of the pagan needs. The increasingly dense human populations, land that used to be productive or less productive. Road-building villages and village by way of concrete results in hard water seep into the ground. 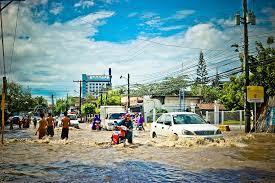 As a result, when heavy rain makes it easy for the occurrence of floods. In addition, the plant in sekitanya plant water shortages became so ineffective photosynthesis. The result further, we feel the pangs resulting from plants not optimally utilizing CO2, the role of plants as producers hampered. Application of intensification of agriculture by means of panca farmer, on the one hand to increase production, while on the other hand are detrimental. For example, the use of fertilizers and pesticides can cause pollution. Another example of the selection of seeds so that in one area of land planted with only one kind of plant, called a types of agricultural monoculture, can reduce the diversity of ecosystem balance so it is difficult to obtain. Ecosystem in a State of unstable. Other impacts resulting from the application of this type is the occurrence of an explosion of pests. Environmental changes naturally caused by natural disasters. Natural disasters such as forest fires in the dry season and the demise of the causing damage to organisms in the forest. In addition, the occurrence of eruption make the area around it is broken.